Will anyone ever forget that day in March 2011 when the massive earthquake and tsunami wrought such destruction across northeastern Japan. Many lives were utterly destroyed. People lost their homes, their livelihoods, and in the worst cases, their family and friends. More than 20,000 have died or gone missing. For those who survived — fishermen and farmers, merchants and city dwellers, people who had been content just getting along with their lives — everything changed that sad day. After 3/11, many survivors almost lost the will to live. But they are now working to rebuild their communities and their lives, step by step, day by day. It is going to be a long, hard journey as they still bear the emotional scars from what happened. We wish to encourage those striving so hard with a potent symbol of courage, human bonds, and peace — the “O-Jizo-san”. People from non-Buddhist countries may not be very familiar with “O-Jizo-san”, one of the Buddhist Bodhisattva, but “O-Jizo-san” holds a special place in the hearts of the Japanese. Since ancient times, “O-Jizo-san” has been a familiar part of everyday life. Statues of “O-Jizo-san” stand along paths and roadways all around the country as guardians of children and travelers, giving nearby residents a sense of courage and peace in trying times. “O-Jizo-san” is featured in many old Japanese folktales. But “O-Jizo-san” is much more than just a religious symbol. “O-Jizo-san” has become a strong cultural symbol of the idyll — a calm and quiet life. No one is an island. It is important to show the survivors that they are not alone and that they are not forgotten. When a person knows that there are others out there who are concerned about them, he or she is greatly comforted. But how can we show them our compassion? Of course, it is difficult to physically be with them all the time. But we can show our concern by entrusting our feelings of compassion to “O-Jizo-san”. We can gather together all the feelings of goodwill of people around the world, and give that compassion physical form (a statue). Our goal is to erect 50 such statues in towns and cities along the Pacific Coast of northeastern Japan. The compassion embodied by your kind donations will be turned into statues of “O-Jizo-san”, which will then be erected in the affected area in your stead. Your sincerity will become one with that of many others, and will help lift the spirits of those in the affected area for many decades and centuries to come. So that we will always remember those who died that day. So that we will always remember the courage and efforts of those living in the zone. 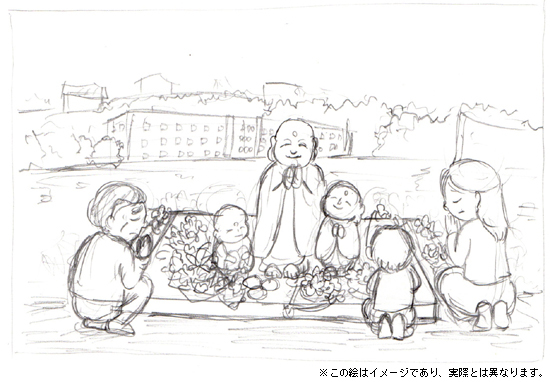 So that we will always remember the sincerity of the donors who made the O-Jizo-san Project possible. The “O-Jizo-san Project”, a registered NPO, will be a long term effort. We would be very grateful for your support.